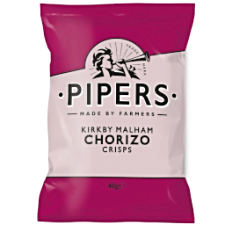 Pipers Crisps Kirkby Malham Chorizo available in 40g bags. Chris and Nigel Wildman are farmers in the Yorkshire Dales National Park where they rear rare breed Oxford Sandy and Black pigs and have a flock of sheep that graze the lush pastureland around their farmyard. As well as being passionate farmers, Chris and Nigel are talented butchers and charcutiers. They prepare their own lamb and pork for the local markets and restaurants but also make the award-winning chorizo that goes into Pipers crisps. It's a delicious blend of the finest quality pork, smoked paprika and spices that is then traditionally dry cured for three weeks to develop the intense flavour we love.